As a teacher in a Project Based Learning (PBL) school, I cherished the projects I created. I worked diligently to ensure that all PBL units I developed were rigorous and engaging. They were oftentimes a beautiful marriage between my Schoolwide Learning Outcomes and my state content standards, a labor of love that took weeks to prepare and weeks to implement. I had students usually more drawn to art or reading or athletics declare that mine was the first math class they ever enjoyed. A substantial pillar of this class they so enjoyed was a PBL approach in which students created ­amazing complex products that aligned with my project goals. In order to develop math fluency, I incorporated consistent math scaffolding into a meaty project tied to the “real world” that would create cognitive connections in students’ brains that would last well after the unit test was completed. I am now, however, unconvinced that a solely PBL approach in mathematics is always the most effective conduit through which math and 21st Century skills are transmitted. My pet theory as to why our math scores went up in year one of switching to PBL wasn’t that they were necessarily better at math, but that since they were used to reading an Entry Document and analyzing it and problem solving without direct instruction, they didn’t freak out when they saw a complex problem on a state test. Instead of simply, say, multiplying together every number in a long word problem, they actually read the problem and tried to parse out what they knew and what they didn’t know. Writing for explanation is good. Along with reading critically, writing mathematically is a universal good. It’s why students must be given the explicit task of parsing out a problem. 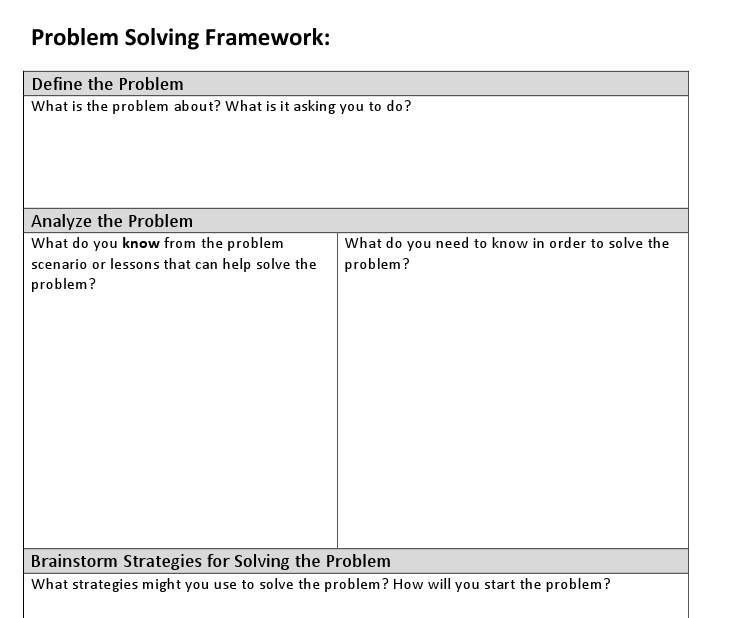 When you look at this example of a Problem Solving Framework intended for student consumption and guidance, you’ll see it’s hard to avoid critical reading and writing in your math class. Students steeped in inquiry is good. You always want there to be enough bread crumbs for students to want to follow a particular path. If you can provide that narrative such that students are just barely at the answer, you’ll have them desiring you to teach them. Furthermore, you always want them to be striving towards a higher plane of learning. Oftentimes, once students reach a solution, if you haven’t provided additional routes to a solution, or the potential for multiple solutions, their thinking will cease. Either informally or formally, teachers need to be constantly assessing for student understanding. Questioning, journal entries, and formal assessments such as quizzes are ways for you to track your students’ progress and keep them focused on the math at hand. As you know, it doesn’t take much for a student to disengage in math. Sometimes, if a student goes just one day without being assessed in some form or another, there’s a potential to not obtain the requisite mathematics you intended. Multiple entry points into a math problem are good. Even if it’s just drawing a diagram, if every student can make an initial attempt at a Project or Problem, then you’ve already avoided immediate disengagement. And once the whole class is engaged at the start of the problem, you can carry that momentum. Student conversation about math is good. Another theory: any student who can eloquently describe a complex mathematical process will never, ever fail a state mandated assessment. These are some of the tenants of a Problem Based Learning approach, which I am convinced is an extremely effective mode of both mathematics instruction and 21st Century skills development. At the New Technology Network New Schools Training (#NST2011), I had the opportunity to work with math teachers new to an inquiry based model of instruction. I asked them to list the characteristics they would like their students to leave their class with. Among the characteristics that received the most audible support were Confidence, Critical Thinking, Persistence, Math experts, and great Collaborators. Upon reflection, the teachers and I came to the realization that a Problem Based Learning mode of instruction can develop these characteristics in our math students. I would define a good problem as one that contains multiple attributes of the list of “things that are good” above. Those are sort of my criteria. Even my best Projects saw students go a couple days here and there without them being practitioners of mathematics: requiring students to narrate a voice-over to a video. Even my best Projects were contrived when I tried to fit math into the Project were it doesn’t belong, affecting the authenticity of the Project at its core: requiring parallel lines to be drawn onto an already-created light rail map for some unknown reason. And once the threads of math and authenticity begin to get pulled away from a Project, it can unravel quickly. And then you’re left with a five-week investigation that students don’t fully believe and you don’t fully believe in. So what is a Problem, in the sense I am talking about a Problem Based approach in Mathematics? What does it look like? Students read/view an Entry Event, which launches them into the Problem Scenario. A prescription for a solution is NOT included. Students brainstorm “Knows”, “Need to knows”, and “Next steps”, all the while being guided by the facilitator to generate the intended learning outcomes. Students work in pairs or groups to solve the problem, beginning with what was brainstormed in the “next steps” section of the entry document. The facilitator prepares workshops and lessons and has helpful resources at the ready, as needed. Students present their solution in some form. This process is similar to the Projects of PBL, the primary difference being size and scope. A Problem generally focuses on one specific key concept or skill and lasts only 2-5 days, unlike a large swath of standards and 2-5 weeks in the former. This process allows for all the inquiry-based learning of PBL, but on a much more rapid scale to allow for differentiation, assessment, and possibly revisiting a concept or two. Also, by nature of their shortened scope or size, it forces the student to think about the mathematics involved, rather than the final product. This final point is crucial. What, then, of all the Projects I created as a PBL teacher? I really liked them, and sometimes my students did too. Moreover, they were scaffolded well enough to avoid one of the great pitfalls that can sometimes plague Math PBL: students focusing solely on the product, not the process, thereby avoiding the Math content. Am I just to toss out those Projects that I worked so hard on and engaged students? Either due to my better judgment or my educational hoarding tendencies (I think most teachers have this disease) I have not and probably will never take the step of dragging any folders into the recycle bin on my desktop. Why? Because I might want to use them someday. Maybe I’ll see a way I can condense those sprawling, hyper-relevant (or pseudo-relevant) projects into a concise, maybe-not-quite-as-relevant problem. Maybe I’ll use one of the scaffolding activities as the basis for a problem. Shoot, maybe I’ll use it as a Project again someday. I can’t deny that I had students buy into my class through the drug of the product-focused Project. I’m really glad I did, too, because I’m just not that good of a teacher that I can get by solely on math content. If I have to bribe students every now and then with the carrot of them creating a cool animation, video, or presentation in front of community members, so be it. And if you want to do the same, and have the ability to create engaging, authentic, rigorous, and math content-rich PBL units, go for it. And while you’re at it, post it somewhere public so we can all see it and learn from you. But continually ask yourself the following questions: what are the students engaged in right now, the product or the math? When’s the last time I probed each individual student for their math knowledge? And, is this Project really that good, that I can be sure, absolutely sure, that students are becoming fluent in mathematics? The challenge here is not to make you question the use of Project Based Learning, or even to disregard it as a potential math educational tool. The challenge is to develop Problems that are equally engaging as your projects. So let’s begin that work. An array of Problems that are equally engaging as Projects, and to get the student to consistently think about math: those would be things that are great. * – Update: This 5th step did not appear in the original version of this post, but a friend pointed out that this is as crucial as any step. She was absolutely correct. So, what exactly am I supposed to eat? 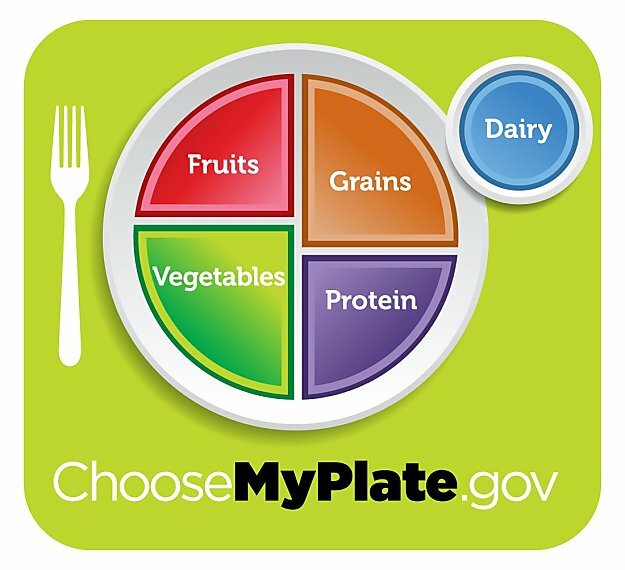 The new MyPlate icon vs. the classic Food Pyramid vs. Geometry. A month ago, I was considering writing a post on the old (now “old, OLD”) food pyramid – you know, the one we all grew up with – and the new (now “old”) food pyramid, unleashed in 2005. It would be about area of triangles and trapezoids and Geometry and possibly graphic design. 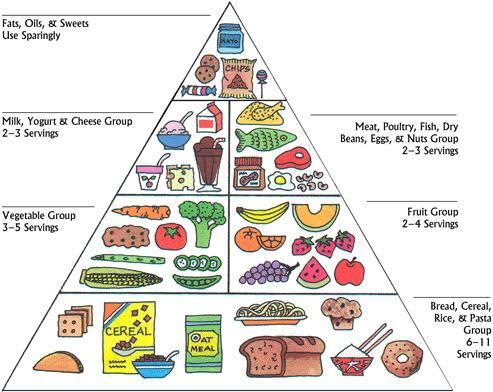 I was all set to contest that the new (“old”) food pyramid, adopted in 2005, was garbage mathematically and visually. And the challenge was for students to come up with a better, more mathematically accurate, food pyramid. Then the United States government dropped the new MyPlate diagram in my lap. Visually, and graphic design-ally, I think it’s miles better than the new (“old”) food pyramid, where you had no idea what each of the 137 slivers meant and exactly how much area was each of the 137 slivers. Also, it was unclear why it was a triangle at all? 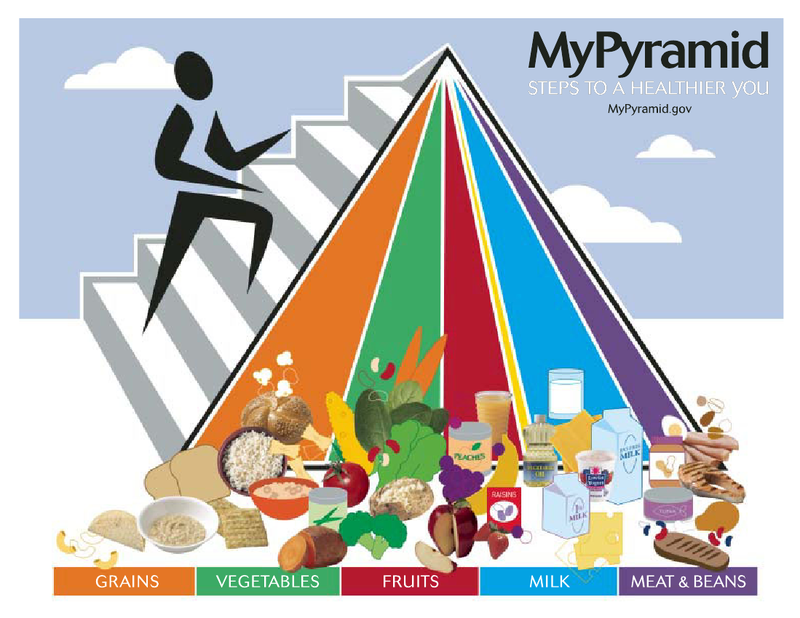 Why is that person climbing that pyramid of food? Are you supposed to eventually eat less and less until you eventually eat nothing?? Not sure if it’s mathematically better. Area of a sector of a circle whose vertex doesn’t meet in the exact center? Now THAT’s a mathematical investigation! So I think, without having done any calculating, the new MyPlate is better. But you know what? That’s probably something for the students to decide, right? Which of these government sponsored food diagram is the “best” and why? So, how much of each food group are we supposed to eat again? I would start by hosting a class discussion on what would make a diagram the “best.” Have students develop a rubric before you even begin. Potential categories: mathematical accuracy, ease of understanding, etc. Have students find the area of each piece of each diagram and report back what the heck it means. 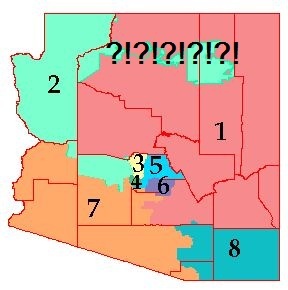 You might want to assign different groups a different diagram, or not. Have students attempt to craft their meals according to the three food diagrams for a week. You might want to assign different groups a different diagram to emulate, or not. Compare the diagrams to each other: are they trending in a healthier or unhealthier direction? 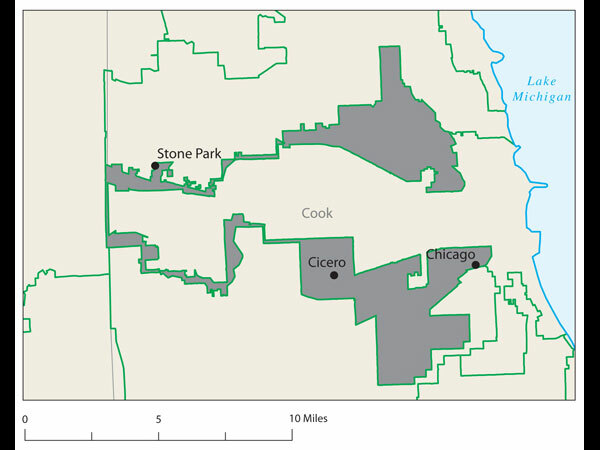 The areas are representative of a 2,000 calorie diet. What if you had a 2,500 calorie diet? How would we dilate the pieces of the diagram? There are lots of different ways I think you could go with this as far as guiding questions and activities, but invariably it will come back to the area of these shapes. And tasks that have several entry points and investigation/exploration opportunities for students that require a mathematical understanding are always worth the time. 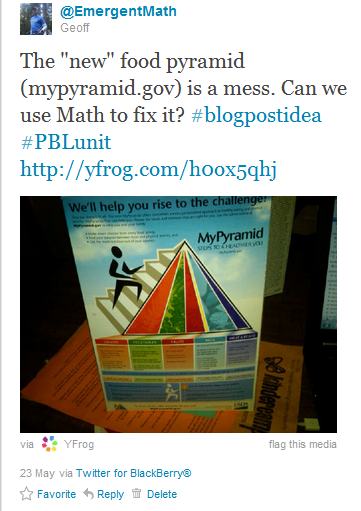 How else might we use the Food Pyramids and MyPlate diagrams to better math understanding? * Update: Commenter Sneha suggested this activity. I love the idea. Connection to Geography, anyone?